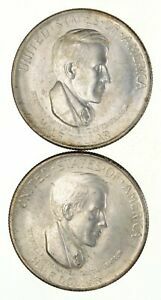 When the first silver commemorative coins were produced in the United States beginning in 1892, they were intended to celebrate specific historic events or to raise funds for the advancement of a specific commemorative cause. This purity of purpose, however, would last less than thirty years. 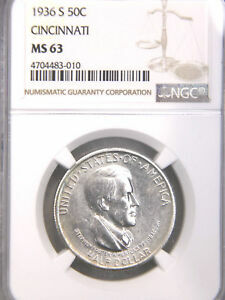 By 1920, the striking of commemorative coins was considered primarily a fund raising device, and the first of the so-called "nonsense" commemoratives were minted. 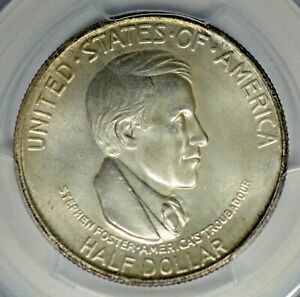 A perfect example was the Alabama half dollar - authorized by Congress in 1920 as an afterthought for a centennial celebration held in 1919 with coins struck in 1921. 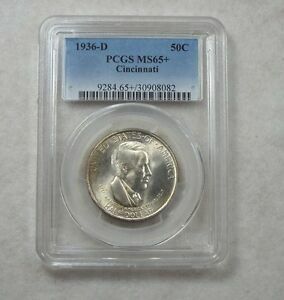 The trend toward increasing commercialization continued throughout the 1920s and on into the '30s, reaching its zenith in 1936 with the minting of the Cincinnati Music Center commemorative half dollar. 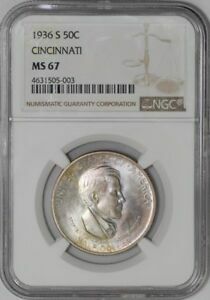 Ostensibly struck to celebrate the anniversary of Cincinnati, Ohio "as a center of music," and to commemorate "its contribution to the art of music for the past 50 years," the real purpose behind this half dollar was to make money for a small group of coin collectors and dealers, primarily Thomas G. Melish. 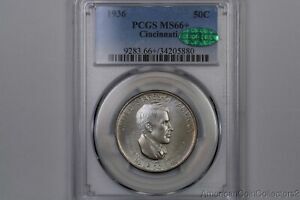 While it may be true that Cincinnati has a long and rich musical heritage, nothing of consequence occurred there in 1886 to warrant striking of these special fifty-year anniversary coins. 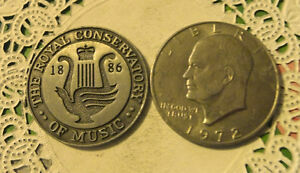 In fact, if the Cincinnati Music Center Commemorative Coin Association actually had any music lovers among its members, they would have known that the city's musical tradition began in earnest in 1873. That was the year the May Festival Association, a choral group of 1,000 voices formed from music societies throughout the Midwest, was founded. It was directed by the illustrious Theodore Thomas. In later years Thomas took the Cincinnati Orchestra on nationwide tours, and was largely responsible for the growing appreciation of orchestral music in late 19th-century America. Although Thomas would have been a logical choice for a commemorative coin celebrating fifty years of the city's musical tradition, the anniversary years noting that occasion would have been 1873-1923. But these dates didn't work for Thomas Melish: This was 1936, and he was determined to get a commemorative coin approved, even if it bore little relation to historical facts. Apparently, his motivation was greed, pure and simple. In fairness to Melish though, the Treasury Department was fully aware of the dubious nature of the circumstances behind this issue. The Commission of Fine Arts, an advisory panel to the Secretary of the Treasury, wrote a lengthy summation detailing the various reasons such a coin should not be minted. 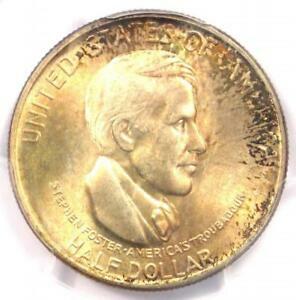 Listing all the historical inaccuracies and fabrications, the Commission particularly took issue with the inappropriate use of Stephen Foster on the obverse of the proposed coin. While Foster did indeed live in Cincinnati in the 1840s, during the three years he resided there, he was a bookkeeper in his brother's firm. It was not until he moved to Pittsburgh and later New York that he wrote his most famous songs. Melish enlisted artist Constance Ortmeyer to design the coin. Ortmeyer's bust of Foster on the coin's obverse was surrounded at the rim by the inscriptions UNITED•STATES•OF•AMERICA and HALF DOLLAR. Directly below Foster's portrait is the caption STEPHEN FOSTER•AMERICA'S TROUBADOUR: Apparently either Melish or Ortmeyer took that phrase from a biography of Foster published in the early 1930s. The reverse features a kneeling female figure, representing the Goddess of Music. In her hands she is holding an undersized lyre, ridiculed at the time by noted dealer B. Max Mehl, who wrote it "must have been bought at a 5c and 10c store as it seems to be only a toy." The Commission of Fine Arts was more tactful in its criticism of the reverse, calling it "not a complete design ... the lettering ... is only sketched and barely that." The inscription CINCINNATI•A• MUSIC•CENTER•OF•AMERICA surrounds the periphery, while the mottoes IN GOD WE TRUST and E PLURIBUS UNUM along with the legend LIBERTY appear below the Goddess of Music. Flanking the figure are the dates 1886 and 1936. 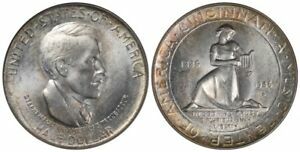 Melish and his Commemorative Coin Association prevailed, however, and on March 31, 1936, Congress authorized the striking of 15,000 coins "at the Mints." 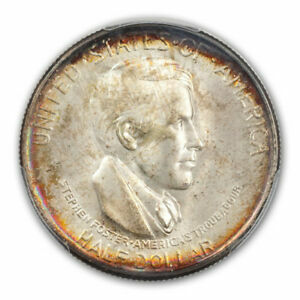 Ms. Ortmeyer's initials, CO, can be seen in the left obverse field, but may barely show on softly struck coins. Originally, Melish wanted 10,000 pieces struck at the Philadelphia Mint, 3,000 in San Francisco, and only 2,000 in the Denver facility. 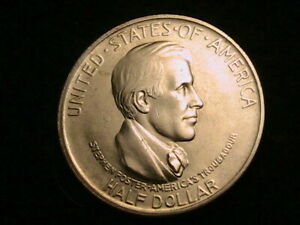 This, of course, would have made the 1936-D coins instant rarities. 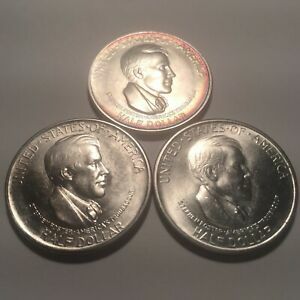 The Congressional Act, however, was amended to specify that the term "at the Mints" meant that 5,000 pieces were to be struck at each of the three mints (D and S mintmarks are found beneath the 1936 date). 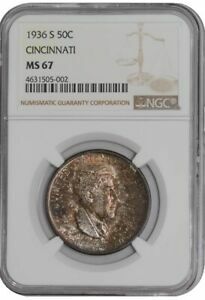 Unlike previous commemorative coinage struck for sale to the general public and available at a nominal fee (usually $1 for a commemorative half dollar), the Cincinnati sets were issued at a costly $7.75 per set. 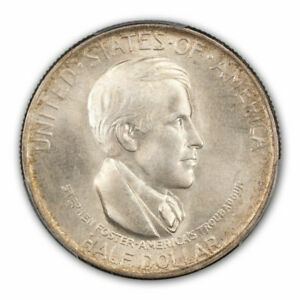 Very few sets were actually sold at this price, however, as the entire mintage (which was distributed through Melish) was supposedly "over-subscribed." Immediately after the coins were struck in July and delivered to the Music Association, Melish began to sell sets on the secondary market for $45. Demand and speculation soon drove the price of the sets to $50, and finally $75. Melish did provide collectors with an interesting adjunct to the Cincinnati series: the first 200 PDS sets were specially prepared and assembled. The coins were caught by a pressman wearing soft gloves who then slipped the coin from that mint into a specially marked envelope, in the order of manufacture. These coins were then sent to the Association who inserted them in black leatherette holders. A notarized statement (also signed by Melish) specifying the striking sequence was attached to the three-coin set. Only a handful of these numbered and notarized sets remain today, and they are rarely offered for sale. The remaining 4,800 three-coin sets were placed in the same kind of holder with a celluloid strip to hold the coins in, but lacking the documentation. It is estimated that today fewer than 50 of these sets in unnumbered holders remain intact. No bona fide proofs are known to exist. 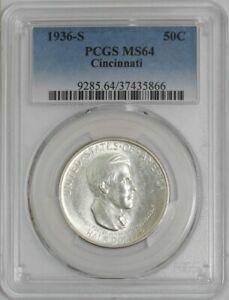 As most Cincinnati halves went directly to collectors, they are usually found in mint condition, generally MS-60 to MS-63. Careless handling at the mints, however, accounts for the frequent appearance of contact marks and abrasions on these coins. Curiously, for some unknown reason, the Denver pieces are more often found with cleaner surfaces than those from the other two mints. Friction is first evident on the obverse on Foster's temple and cheekbone, and on the reverse will first appear on the goddess' breasts and thigh. Counterfeits are known of this issue: both are casts, with unusual surface textures. One shows raised, granular defects like "bubbles" around the dates and mottos, and file marks around CINCINN. 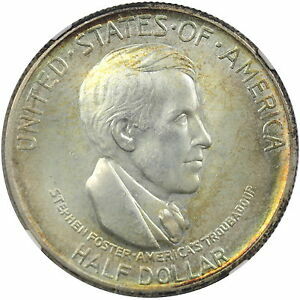 The second cast counterfeit has minute pinholes around Foster's ear and file marks around the peripheral legends on the reverse. Today, Cincinnati halves are recognized not for the greed that created them, but rather as rarities in their own right. They are considered a challenge in high grades because of the large, open areas of the coin and the smooth features on the central figures. The exposed fields and smooth devices make it difficult for a bagmark to blend in with the design, and as a result, gem examples are very elusive. 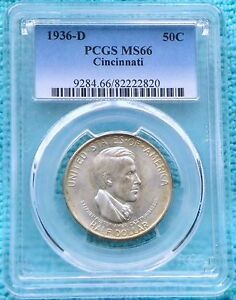 While the origins of the Cincinnati Music Center half dollar are inextricably linked to the pursuit of personal profit on the part of Thomas Melish, today few know or care. The coin was legitimized by an Act of Congress, and the city of Cincinnati does indeed have a long and proud musical heritage. Thomas Melish succeeded to a far greater extent than he could have imagined in 1936. 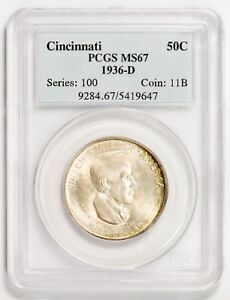 Not only did he create a rarity for the immediate consumption of collectors and dealers in the 1930s, but sixty years later his Cincinnati halves are still actively sought as a rarity in the long and varied commemorative series.